It is necessary to know the working of matrix keypad before we proceed on the project interfacing matrix keypad with the microcontroller. By its name '5x5 Keypad' means it consists of 5 Rows and 5 Columns, totally 25 keys. Look at the fig below which is the general 4x4 keypad(24 keys) which we get ready made from market. 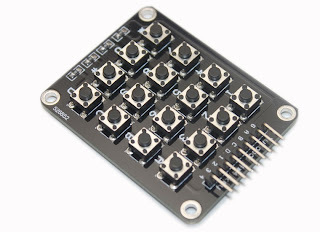 It is very easy to get 4x4 matrix keypads from markets but difficult to find 5x5 keypads, but its very easy to make by our own. Note these points from the above fig. 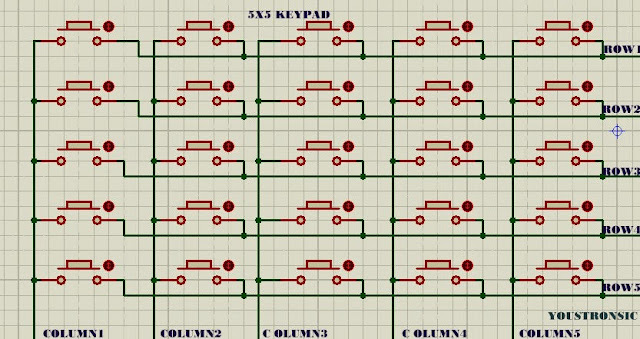 All the rows and columns will be connected to microcontroller(we will see in next post). 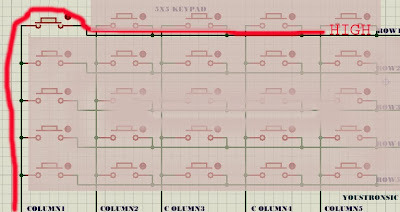 Suppose we make 'Row1' high and we press the 1st button then column1 also becomes high because button's one arm is connected to row and other arm to column, when we press the button then both the arms will be shorted and current flows from row to column. 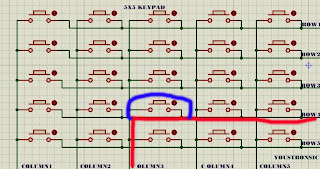 Look at the below fig to understand clearly, red color indicates the current flow during the button press. Similarly if Row1 is high and 3rd button is pressed then column3 becomes high,so on..
Now answer me, if i make Row2 high and pressed the 7th button then which column will be high?? Answer is simple, column which is connected to 7th button it will be high i.e column2. Now one more question if column 3 is high and row 4 is high then say me which button has been pressed??? For answer look at the below fig. Just look at the corresponding row and column to know which button is pressed, button marked in blue color which has been pressed. If you understand this simple concept then you have successfully understood the working principle of matrix keypad. First we make Row1 high, if the key is pressed then obviously one column will becomes high. Check which column becomes high, from it we know corresponding key has been pressed. If suppose key which has been pressed is not on the row1 then all columns will be low. Row1=1 => check columns => if column is high then take its corresponding key. Row2=1 => check columns => if any column high take its corresponding key. Row4=1 => check columns=> if any column high take its corresponding key. Row5=1 => check columns=> if any column high take its corresponding key. Note when one row is high we should make all other rows to zero. We repeat all of these steps at high speed so that we can detect all the pressed keys.